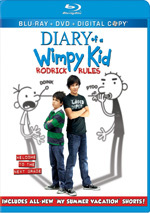 After the movie franchise debuted in 2010, we got three Diary of a Wimpy Kid films in rapid succession. Subsequent chapters emerged in 2011 and 2012. Confronted with declining revenues and an aging cast of kids, the series took a break before its return with new actors in 2017’s Diary of a Wimpy Kid: The Long Haul. Once again we greet the Heffley family: father Frank (Tom Everett Scott), mother Susan (Alicia Silverstone), teen Rodrick (Charlie Wright), adolescent Greg (Jason Drucker) and toddler Manny (Dylan and Wyatt Walters). They embark on a road trip to go to the 90th birthday party for their “Meemaw” (Mimi Gould). This seems like a less than ideal vacation to Greg – our titular “wimpy kid” – and he plots to spice up the trek. He wants to visit a big videogame convention and attempts to get the family on a detour. Though I do suspect declining box office receipts led to the suspension of the Wimpy Kid movies, that may not have been the main factor. Though none of the films became big hits, they turned profits, so I suspect the franchise paused mainly to regroup and get new actors. New child actors, that is, as Zachary Gordon – the original Greg – clearly “aged out” of the part, and the same became true for the other young performers. I guess Haul could’ve brought back Steve Zahn and Rachael Harris as the parents, but a full re-cast made sense. I’ll be curious to see where the series goes after this, because financial repercussions pop up here. The weakest of the first three films still topped out at almost $50 million in the US, but Haul died after a mere $20 million – even with a low budget, it didn’t turn a profit. As someone who turned 50 this year, I’m decades away from the target audience for the Wimpy Kid tales, but I can still recall my youth well enough to connect with some aspects of the series’ character/narrative choices. At its best, Haul links to memories of childhood awkwardness and banality to lend an amusing sense of introspection. For a brief period, Haul connects to that sense of the Wimpy Kid series. It reminds us of the nature of family road trips and all the ups and downs those entail. Eventually, however, Haul goes completely off the rails and utterly departs the land of the real. It embraces wild farce and cheap potty humor, factors that make it completely collapse after such a promising start. I think Haul officially loses its way when the family stays at a dumpy motel and Greg antagonizes a fat guy with a bad beard (Christopher A. Coppola). That scene loses any sense of believability and sends the movie into a death spiral. After that, we get one tacky, cheap stab at comedy after another. While on a thrill ride, Rodrick pukes into Mr. Beardo’s mouth. Manny wins a piglet who eventually takes a massive dump into the van’s baby toilet. Greg urinates into bottles. And on and on and on. Haul can’t even maintain its own sense of internal logic, as the movie changes the rules dependent on its desired comedic path. One minute, the Heffleys can’t afford to stay anywhere better than a disgusting motel. Then the next, they have the wherewithal to book a room at a fancy hotel. Why the shift? To fit those comedic desires, of course. We need the crummy hotel to introduce the trashy Beardo family, and we need the posh spot so the pig can raid the minibar. All of these factors turn Haul into a real disappointment. While the movie gives us some laughs in its opening moments, it quickly blasts itself off-track to embrace cheap potty humor with few redeeming qualities. 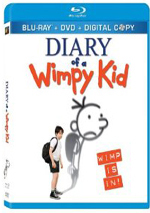 Diary of a Wimpy Kid: The Long Haul appears in an aspect ratio of approximately 2.39:1 on this Blu-ray Disc. This was a terrific visual presentation. From start to finish, sharpness looked nearly immaculate. Only the slightest hint of softness affected wide shots, and those examples occurred too infrequently to cause problems. Instead, the film looked concise and well-defined. No issues with jagged edges or moiré effects occurred, and edge enhancement was absent. I also failed to detect any source flaws. In terms of colors, the movie featured a teal and amber palette. These tones didn’t seem overwhelming, but they leaned that way. Across the board, the hues looked positive. Blacks were dark and deep, while shadows appeared clear and smooth. I thought the movie consistently looked great. I felt that the DTS-HD MA 7.1 soundtrack of Haul seemed fine but it didn’t excel because of a lack of ambition. Like most comedies, the movie featured a limited soundfield that favored the forward channels. It showed nice stereo spread to the music as well as some general ambience from the sides. Some of the broader comedic scenes opened up the mix, though, and those added pizzazz to the presentation. The tracks offered nice localization and used the surrounds in a compelling way on those occasions when it decided to go “big”. Audio quality appeared good. Speech was natural and distinct, with no issues related to edginess or intelligibility. Effects sounded clean and accurate, with good fidelity and no signs of distortion. Music was perfectly fine, as the score and songs showed positive dimensionality. This track was good enough for a “B”, largely due to the occasional “big scene”. When we head to extras, we begin with Making a Scene, a domain with three featurettes: “Behind the Squeal” (4:39), “Alien Abduction” (4:07) and “When Seagulls Attack” (3:33). Across these, we hear from writer/director David Bowers, producers Nina Jacobson and Brad Simpson, animal wranglers Carol and Greg Tresan, animatronics/puppeteer Paul Mejias, author/screenwriter Jeff Kinney, executive producer Timothy M. Bourne, production designer Aaron Osborne, makeup department head Travis Pates, visual effects supervisor Chris LeDoux, on-set visual effects supervisor Nicholas Johnson, and actors Charlie Wright, Wyatt and Dylan Walters, Alicia Silverstone, Jason Drucker, Chris A. Coppola, and Tom Everett Scott. “Making” looks at the use of trained pigs and an animatronic porker, sets and locations, stunts, and various effects. The three clips offer fairly useful views of the scenes in question. Next comes Greg Heffley’s 10 Rules for a Perfect Road Trip. It goes for three minutes, three seconds and features a discussion of ways to make your vacation run well. It’s a cutesy piece that consists of movie clips and exists to promote the flick. With Road Games, we find a three-minute, 53-second clip that gives us movie-related activities to play during a trip. Like “Rules”, it intends to sell the movie, but at least it gives us some moderately intriguing tasks that might be fun on the road. We find a tutorial via Learn to Draw. In this 14-minute, 26-second piece, Kinney teaches us how to sketch Greg, Rodrick, Manny, Rowley, and the pig. Kinney gives us good notes about his inspirations and techniques in this fun reel. A Decade of Wimpy Fun fills 13 minutes, 26 seconds and features Kinney, Drucker, Bowers, Jacobson, Scott, Silverstone, Simpson, and actor Owen Asztalos. “Decade” offers a quick history of the book franchise and its move to the big screen. While fairly superficial, “Decade” still offers some nice insights from Kinney. After this we locate a collection of Bloopers and Deleted Scenes>. It goes for four minutes, 34 seconds and focuses mainly on the “blooper” side of the equation. The deleted scenes tend to be brief comedic moments and not anything substantial. Deleted Animation splits into two segments: “Perfect Family” (0:42) and “Boat” (0:42). Both offer amusing interstitials. Another featurette, Haulin’ Through Georgia lasts two minutes, 19 seconds and delivers notes from Drucker, Bowers, Simpson, Jacobson, Osborne, Kinney, Bourne, Silverstone, and Asztalos. “Haulin’” offers a few tidbits about the locations but it mostly exists to tout Georgia as a movie Mecca. A Gallery presents 25 stills. It mixes shots from the set with publicity images. Nothing memorable appears. The disc opens with ads for Boss Baby, Captain Underpants and Ferdinand. We also get the trailer for Haul. A second disc presents a DVD copy of Haul. It includes the same extras as the Blu-ray. After a good start, I thought Diary of a Wimpy Kid: The Long Haul would bring us a clever, witty piece of family comedy. Unfortunately, it soon devolved into little more than a string of cheap, puerile gags that lack amusement value. The Blu-ray brings us excellent visuals along with generally positive audio as well as a decent set of supplements. Haul leaves the Wimpy Kid franchise on fumes.